Blurb: A mystery that gives you time to think and a story that makes your mind run wild. Review: I LOVED Rot & Ruin, and as such I knew there was a chance that this book would leave me feeling underwhelmed, and it did. Rot & Ruin is full of action and emotion and running and jumping and zombies and monsters of the human variety. It's an imaginative smörgåsbord! 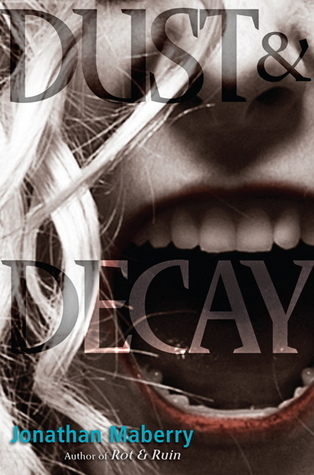 Dust & Decay, however, is a much slower book. I felt like it took a LONG time for the story to get ANYWHERE. The beginning of this book is a lot of "talk-talk-talk" and then FINALLY they get moving, but there is SO MUCH going on that the whole book only spans a couple days even though it's 500 pages long. The thing is, that "so much" that's going on isn't very... interesting. Sure there are zombie attacks and crazy-rhino attacks and new mysteries that really make you think, but they didn't go anywhere. Aside from some character growth, I feel like this book didn't progress the story at all. And because it was so slow, I felt like there was a lot more cheesy stuff in it. Lotsa teens acting like doofuses. HOWEVER, this book is going to be quite a long series (I know there are at least two more books), and if Maberry works well with the other two books then this book could really pay off. I have a feeling that Dust & Decay may be one of those books that you don't really appreciate until you've read the entire series (i.e. Prisoner of Azkaban). So if you liked Rot & Ruin, PLEASE pick this one up. R&R is WONDERFUL and I can't wait to see where Maberry takes the characters in this series. I just hope the next book takes them somewhere a little quicker. Hey, I LOVED PoA! It was my favorite until the seventh came out and replaced it. I am bouncing up and down in my seat right now. I am so excited! I enjoyed Rot & Ruin so much. My copy of D&D should be here Friday! But then I have to share it with my son because we both want to read it ASAP. We both loved R&R. And yeah, there with be a total of 4 books. The 3rd will be Flesh & Bone, and the 4th I think will be Fire & Ash.